We made this recipe quite a while ago, inspired by a Moroccan recipe we found on the internet. We chose the easiest way of doing it, using some frozen vegetables (use some ready-made vegetable mix or pick your favorite ones – many sorts of vegetables fit this recipe, really). Or you can simply omit the vegetables, and stick to rice and garlic. 250 grams vegetables of your choice, cooked. Start by washing the chicken. Pat it dry with some kitchen paper and set it aside. Bring a large quantity of water to the boil and add some salt. Cook the rice for 10 minutes, until it begins to soften but is not completely cooked. Drain the rice and set aside. In a separate bowl, blend the saffron and the pepper with the garlic and the olive oil. Coat the chicken with this mixture. 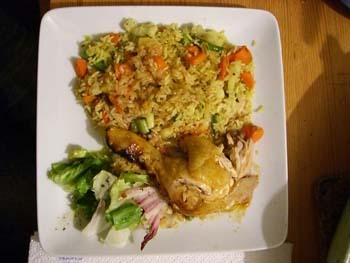 Mix the rice with vegetables, add some spices if you wish and stuff the chicken. 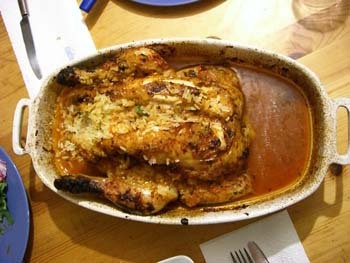 Place the stuffed chicken in a large oven-proof dish. Cook in the hot oven for about 1 hour, until the skin is crisp and brown.